Susan Sluiter currently works as a Clinical Psychologist at Platinum Health Medical Aid, Service Provider for Anglo American. She is part of a multidisciplinary team which includes clinical psychologists, psychiatrists, doctors, and other medical professionals. Susan has a Masters Degree in Clinical Psychology, obtained from RAU Johannesburg. After numerous sessions of delivering TIR and witnessing its liberating effects on clients, I became convinced that this is the tool of permanent change. The truth is, even after attending the TIR Workshop, one may still fail to appreciate the value of this tool. It was actually only after I started using this tool that I understood its power. Everything fell into place and began to make sense to me. I enjoyed seeing the massive sense of relief and liberation it brought to my clients and, yes, those changes were permanent and didn’t rely on willpower. TIR was more than a tool, it became the lens through which I began to view all aspects of mental health. This trauma lens provided a map for exploring, discovering and resolving the trauma that I came to realize was the culprit behind almost all psychological disorders and problems. In its complexity, I found the simplicity I was looking for. The therapeutic focus became to always de-traumatize to bring about permanent change. Unlike most other forms of psychotherapy, TIR is a subtraction rather than an addition tool. I believe that it is exactly this process that justifies the epistemological shift to understanding mental health through the trauma lens. TIR is about extracting pain rather than adding skills. The definition of psychological trauma can vary. From a TIR perspective, trauma can be defined as any incident that had a negative physical or emotional impact on an individual. This is a very subjective issue as the something could be perceived as traumatic by one individual, but as commonplace and harmless by another. The important thing is the emotional and physical impact the incident had on the individual, its subjective impact. The reason it is so important to view trauma in the broadest way possible is because it explains the chronic mood states of our clients as well as how subconscious intentions and automatic emotional responses affect their current lives. These will be explained below. Traumatic incidents, when understood in the broadest sense possible, have a massive effect on our neurobiology, emotional states and behavioral patterns. Therefore, they can be seen as the driving force behind almost all psychological problems and disorders. When I say traumatic incidents “in the broadest sense possible,” I refer to the everyday incidents of trauma that are objectively perceived as minor, such as an embarrassing comment by a teacher, conflict with a friend, breaking your mother’s expensive vase, etc. It involves an understanding of how the emotional knocks we take on a daily basis affect our neurobiology and continue to have an impact on us in later life. The understanding of subconscious intentions, automatic emotional reactions and responses and chronic mood states are so crucial when it comes to looking at mental health through a trauma lens. Minor and major psychological and physical trauma involves a complex description of the effects on the brain. First let us look at the subconscious intentions that form as a result of trauma, and how these subconscious intentions continue to affect us throughout our lives. This is one of the most important considerations when we approach psychotherapy through a trauma lens. Let us look at an example of how intentions are formed and how they affect the individual in later life. A client came to treatment complaining that his wife wanted to leave him because of his pathological jealousy and jealous rages. He said that he had tried to change too many times and promised his wife after every rage incident that he would not do it again and that he would stop checking up on her and being suspicious. He explained how he had no idea why he felt and behaved like that, but that he continued to fail in his attempts to stop these thoughts, emotions and behavior. He was scared to lose his wife and was desperate to get help. Now of course, there are hundreds of different theoretical lenses in psychology through which his problem can be viewed. The lens through which his problem is viewed will determine the therapeutic approach taken to resolve this issue. I hope this example can convince you that the trauma lens is basically the only one that could sufficiently explain and resolve this problem. I looked at his problem through the trauma lens as it was so crystal clear to me. His problem was trauma-driven. Looking through the trauma lens implies that if an individual is suffering from unwanted negative emotions, thoughts and behaviors, it must be the result of some past traumatic incident. In other words, trauma is behind this. The practitioner’s job is to help the client discover the trauma and then, of course, help the client to resolve it. As mentioned above, trauma shouldn’t be viewed in a narrow way. It includes any and all negative experiences in the individual’s past that lead to the forming of self-protective intentions. The most important task is to discover the root traumatic incident which leads, in this case, to the subconscious intention of not trusting his wife. We had to explore and describe his emotional and behavioral responses in depth so as to open the neural pathways of association with these intentions. In other words we had to discover the incident in which the intentions were formed that kept his jealous rages alive. We did exactly that and discovered the traumatic root incident during Thematic TIR. [Thematic TIR, discussed in detail later, is designed to trace and resolve current unwanted feelings, emotions, sensations, attitudes and pains]. He was 4 years old and saw his mother kiss a man who wasn’t his father. He became very angry, shouted at his mother, ran to his room and cried upon his bed. It was traumatic for him because he had a very close relationship with his father and, of course, loved and respected him very much. If we look at the intentions formed as a result of this traumatic incident they could be: “From now on I will never trust women” or maybe, “I will from now on always see women as unfaithful” or “Women cheat on their husbands; I will never trust my wife.” We can make an infinite number of guesses about the exact intentions that were formed during this incident, but what we do know is that these intentions continued to affect him for the rest of his life and had a major impact on his romantic relationships, interactions with his wife and subsequently on his marriage and emotional wellbeing. As long as the memories are being controlled by the neurobiological process that involves the amygdala, these intentions won’t go away and can continue to affect him until death. These intentions become stronger over time as the brain reinforces it with other similar traumatic incidents. Can you see how these subconscious intentions can have a massive impact on his relationships? The amygdala cycle in the primitive brain is an extremely powerful force in human emotions and behaviors. Examining a birth trauma lets us look a little bit deeper at subconscious intentions and how they continue to affect us: specifically, the case of a woman who suffered from claustrophobia. After an exploration was done and no root incident was discovered, I asked her to ask her mother whether there was birth trauma. I asked this because I knew there was trauma behind her claustrophobia. I believe there is trauma behind all forms of phobias. In her case the answer was: “My mother said I got stuck during birth.” The storage of trauma can be based on sensory experiences in isolation of language, or concept formation and separate from conscious awareness. Intentions can thus form as early as birth and can continue to affect the individual throughout his life. Pre-language trauma is stored as implicit memories and thus only as a sensory memory. When the senses experience similar stimuli, there will be an emotional response. The intention formed during her birth trauma was that she will from now on always feel anxious when she feels trapped and her brain associated this with other experiences as secondary trauma unfolded, until she reached the point where she was unable to enter an elevator. Of course, not every stuck birth results in claustrophobia. However, from a person-centered point-of-view we accept the client’s interpretation of events as authoritative. I have witnessed individuals discovering root incidents during Thematic TIR, which left them surprised as to how such a seemingly small insignificant incident could have such a massive impact on their lives. I once worked with a client who was extremely attractive but believed he was hideous and would never find a girlfriend. In fact, he was so self conscious that he couldn’t even take his shirt off on the beach. We discovered the root incident where these intentions formed. It was a comment a friend made about the freckles on his back while they were playing in a sandbox. This happened when he was about 5 years old. 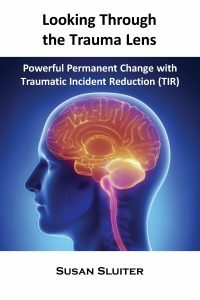 Later incidents strengthened these intentions and countless other stimuli that could trigger the traumatic emotional and behavioral responses were included in the trauma triggering cycle. Can you see how when we define trauma in a subjective way and in a very broad way, it opens up therapeutic doors? This is because we acknowledge the influence of objectively minor trauma on our client’s current issues. Practitioners have the tendency to only look through the trauma lens when major trauma was involved and they forget the subtle, objectively small incidents of trauma and its effect, for instance, the comment about the freckles on my client’s back when he was 5 years old. Not even the client was aware of the impact this had on him, it had to be discovered through TIR along the neural pathway of his current issues. The unfortunate reality is that most individuals are exposed to multiple and sometimes even chronic trauma of this nature, not to mention the effects of more acute traumatic incidents. When the thalamus has interpreted an incident as trauma, it is traumatic for the individual whether it is objectively minor traumatic incidents or major trauma. The understanding of how subtle trauma and its intentions can affect us in later life is what I feel is lacking in our understanding of the impact of trauma on psychological problems and disturbances. Even in objectively minute traumatic incidents, if the emotional charge associated with them is still high, the amygdala takes over and responds on the basis of the intentions that were formed to protect the individual. When this happens and the rational mind is sidelined, it renders the individual helpless to change. In the example of the jealous man, it was evident that there was a strong desire to change, but a powerlessness to do so. He felt that he must try harder and use more willpower until we realized that his inability to change was the result of a root memory and its intentions that were being controlled by his amygdala. This is why willpower and insight do not equal change. This ends the excerpt from Looking Through the Trauma Lens by Susan Sluiter. You can read the full text as an eBook in the Metapsychology Monographs series on Amazon Kindle, Google Play, Apple iBook and other platforms.